Super-Creativity is a complete, practical program of theory, detailed information, and specific exercises, all designed to help you think more creatively, solve problems more effectively, and learn information with new efficiency. Honestly, I did not find first 15 min exercises very helpful & expected a bit more tips on how to be more creative - that's why 4 stars. The main reason I selected this book was to see what else I could learn about mind-mapping techniques. I was disappointed that there was nothing added to what I already learned over the years. It has been almost 30 years since this book was written, long enough for this cutting edge material for 1988 to have merged with present-day pedagogy and popular culture. I highly recommend it if you are new to whole mind thinking (the rationale for using mind maps) or to mind-mapping basics. 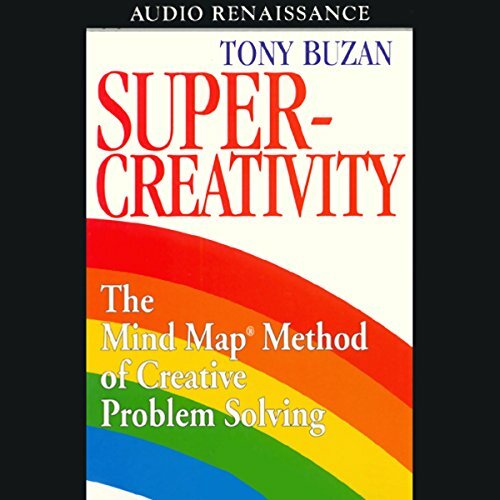 Even though there is no visual material with the CD, the description is sufficient to help the listener visualize the mind map that Tony Buzon walks you through. Additionally, there are several short experiential tasks that create learning for the listening audience. Lame Lame Oh my God, Lame! I got this thinking it was going to be pretty cool, but it turned out to be an hour of non-stop blather about a bunch of nothing. Yeah, yeah, it makes sense, but it's all a bunch of hooey we've all heard before. Don't waste your money and really, really don't waste a monthly credit on this tripe. Only get it if you have way too many credits and you need to buy something that's going to disappoint you and make you slap your forehead. I gotta go now and ice my head. 16 sur 27 personne(s) ont trouvé cet avis utile.